GDS offers the area’s best private and semi-private instruction at four locations: Exeter, NH, Hooksett, NH, North Andover, MA and our newest location, the New England Sports Village in Attleboro Ma. Weekly lessons develop the foundation for an impenetrable goaltending force through structured progressive development. Mike Buckley's system brings out the best in each goaltender through well-structured, challenging and fun drills. At GDS, we believe in the personal development of each student. Developing a confident mind is just as critical as physical development in creating a decisive, elite goaltender. We begin our training with a consultation to learn more about each student. GDS coaches establish a relationship with each and every student, setting specific goals and attacking each goal throughout the season. On the ice we focus the six core fundamentals of goaltending: Skating, stance, positioning, save selection, rebound control and recovery. GDS coaching creates a strong technical base complemented by a focus on an athletic, unbounded style of play. This allows goaltenders to develop their own style based on their strengths, resulting in quick efficient movements and confidence in their game. Video is used in every session from multiple camera angles to visually demonstrate form, speed and balance. Simply call or email us at mbuckley@gdsgoalies.com, or 978-869-9188 to find the best time that fits for you at any of our four locations. Choose the package from the list below. The 25 Week semi private Season pass is a full season development program designed by Mike Buckley for each individual goaltender. The program consist of weekly video, and your time slot is guaranteed for the season. 8 weeks of structured progressive development semi private format. 8 weeks of one on one full hour private lessons. 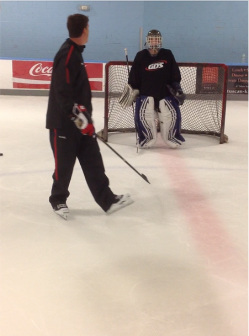 25 week full hour private lessons designed for each individual goaltender by Mike Buckley. Each goalie receivesweekly video and your time slot is guaranteed for the season. Abbreviated five-week option for spring to prepare for Playoffs, tryouts and new technical breakdowns. Exeter, North Andover, Hooksett, Attleboro. Please note that any cancellations of booked lessons require 48 hours notice. You can then reschedule for the following week. You have 7 days to make up your lesson. Should you need to reach us for any reason or to reschedule, please note our contact information below. Cell phone is the best way to reach us should you have a last-minute emergency and cannot make your lesson. Due to the progressive nature of the GDS curriculum, it is of utmost importance that goaltenders make each week’s lesson in their packages. Should missing a lesson be unavoidable, the student may reschedule for another day within that week. The lesson will be forfeited if not made up before the next week’s session.